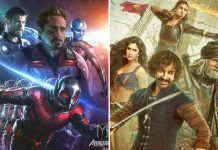 Home » Box Office » Uri: The Surgical Strike Box Office Day 29: Continues To Create History! Now the start of the fifth week is super impressive as the film is collecting as much as all the other Hindi films running in the country. Uri: The Surgical Strike Box Office Day 29: This Vicky Kaushal starrer is in a mode where practically every week one comes up with a revised prediction for the lifetime score. It all started with the film aiming for 75 crore tag, then 100 crore seemed certainty, then story moved towards 150 crore, then 175 crore was a definite possibility and later it seemed that the film could well take a shot at the 200 Crore Club. As has happened though, the film is now going way beyond that, what with 200 crore been achieved in four weeks flat. Now the start of the fifth week is super impressive as the film is collecting as much as all the other Hindi films running in the country. It collected a super impressive 2 crore* more on a very restricted count of screens and with this the overall total has reached 202.07 crore*. Actor Vicky Kaushal, who is playing the role of an Indian commando in the recently released Uri – The Surgical Strike, has said the entire film team is going through a surreal feeling that audience has accepted their war-drama film with open arms. Vicky Kaushal was interacting with media after success of Uri… along with his co-stars Mohit Raina and Yami Gautam in Mumbai. The movie is based on the 2016 Indian Army’s surgical strikes inside Pakistan as a retaliation for the Uri terrorist attack. “Till the film is released, you don’t have an idea if it is going to work. But since the release, the kind of reaction we have received is really overwhelming. It’s a surreal feeling that audience has accepted our film with open arms,” said Vicky Kaushal.